iMoviesoft FLV Converter for Mac can convert FLV to almost any video or audio format on MAC OS X with excellent conversion speed and quality. It can also convert FLV and YouTube videos to iPod, iPhone, PSP, Zune video player and other portable video players. Apart from the main converting functions, iMoviesoft FLV Converter for Mac also owns powerful edit functions like Croping, Triming and Effect adjustment, etc.It's a professional video editor. MAC OS X 10.4 or above, At least 512M physical RAM. 1G Hz Intel processor, or above. iMoviesoft FLV Converter for Mac can convert FLV and YouTube videos to almost any video format like MP4, AVI, etc. with unmatched speed and best output quality. iMoviesoft FLV Converter for Mac can support converting FLV and YouTube videos to many popular audio files, like M4A, MP3, AAC, AC3. You can merge several videos into one output file. Video editing functions like video cropping, trimming and adjusting video effects including Brightness, Contrast, Saturation, etc. can be applicable. You can remove black edges by clicking crop button, choose the clips you like by clicking trim button and adjust video effects by clicking effect button. 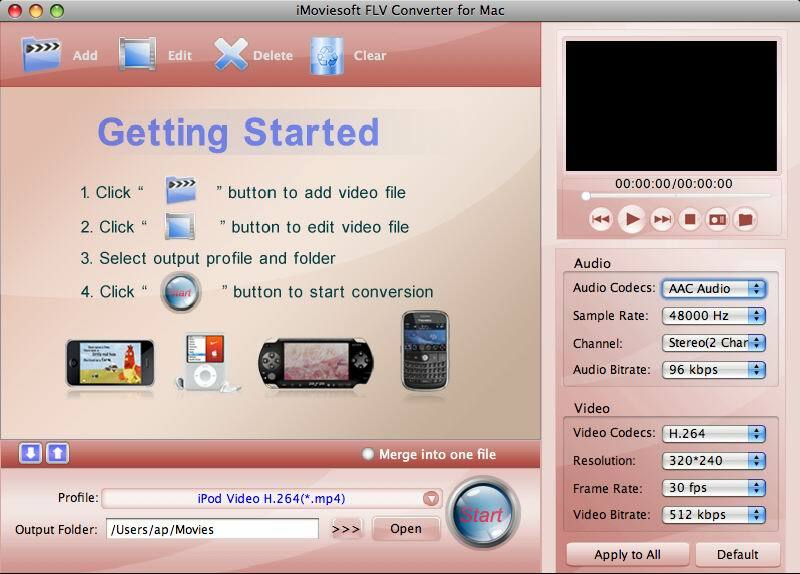 Best FLV Converter for Mac - Convert .flv to mpg/mp4/mov/m4v/dv on Mac OS. it is smartly designed DVD to FLV converter software, Extract DVD video to flv. Qweas is providing links to iMoviesoft FLV Converter for Mac 1.6.2.2 as a courtesy, and makes no representations regarding iMoviesoft FLV Converter for Mac or any other applications or any information related thereto. Any questions, complaints or claims regarding this application iMoviesoft FLV Converter for Mac 1.6.2.2 must be directed to the appropriate software vendor. You may click the publisher link of iMoviesoft FLV Converter for Mac on the top of this page to get more details about the vendor.